The recovery in the global economy is gaining steam on the back of an improvement in both advanced economies and emerging-market countries. A preliminary estimate for the global economy shows that GDP expanded 3.1% annually in Q2, which is just a notch above the 3.0% increase that our Consensus Forecast had expected last month. The print beat the 3.0% rise in Q1 and represented the fastest growth in two years. While Q2 GDP results for most of the world’s largest economies are still outstanding, China posted another exceptional result in the quarter, with the economy expanding 6.9% again. With this solid performance, which paves the way for the government to comfortably meet this year’s growth target of 6.5%, policy makers will now focus on addressing economic imbalances and deepening reforms through the end of the year. Elsewhere in developing countries, the economies are benefiting from resilient global demand and more stable financial markets. Recent uncertainty in some key commodity prices, however, has the potential to derail the economic recovery in some key economies. Among developed economies, the Euro area economy is in a sweet spot on the back of a declining unemployment rate, accommodative monetary conditions and a stable political environment. Against this backdrop, analysts are betting on when the European Central Bank (ECB) will begin the unwinding of its bond-buying program. That said, low inflation due to weak wage growth and falling energy prices limit any sudden and aggressive move by the Bank. In the United States, while the economy likely accelerated in Q2 on the back of renewed gains in the job market, political uncertainty continues to cloud the economic outlook. President Donald Trump failed to pass his healthcare reform to replace “Obamacare” as he was unable to gather enough support in the Senate so far. Moreover, the alleged link between Trump and some of his associates with Russia is eroding his popularity. On the other side of the globe, the Bank of Japan (BoJ) pushed back its timeline to reach the 2.0% inflation target to 2020, suggesting that the country’s ultra-loose monetary policy stance will remain accommodative for the foreseeable future. Economic conditions are solidly improving as healthy global demand and rising consumer spending are propelling economic growth. The global economy is also benefiting from monetary policies that are still largely accommodative and less tight fiscal policies following years of harsh fiscal consolidation processes. Moreover, downside risks that threated to jeopardize global economic activity this year such as political instability in Europe, rising trade protectionism following the election of Trump in November and an abrupt slowdown in China have not disappeared, but they have certainly diminished. That said, some key factors to watch in the near future as they could affect the global outlook are: geopolitical risks, particularly in the Middle East, upcoming elections in Italy—which will test the health of the anti-euro movement—Trump’s ability to deliver on his fiscal pledges, and less supportive economic policies in China. 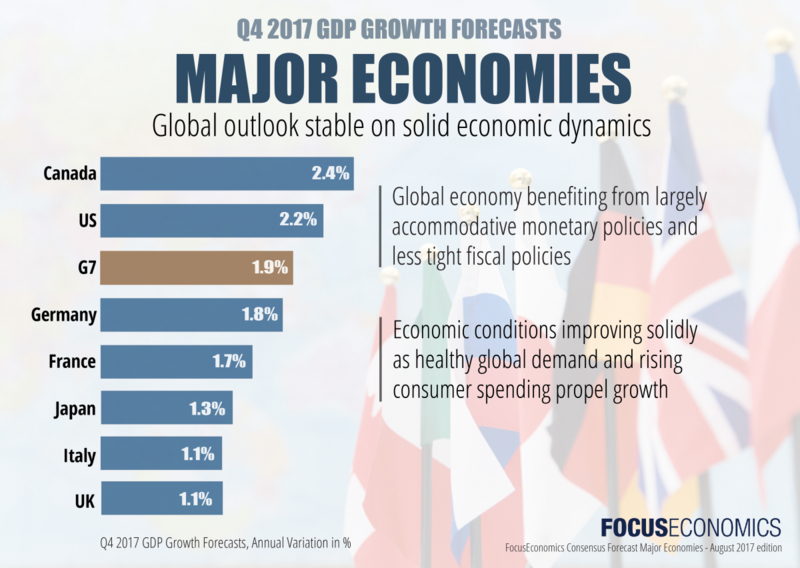 Analysts surveyed by FocusEconomics see the global economy growing 3.0% in 2017, unchanged for the third consecutive month. Stronger growth in the United States and in a number of emerging economies will propel growth in 2018 to 3.1%. This month’s stable outlook for 2017 reflects unchanged growth prospects for Japan, the United Kingdom and the United States. Forecasts for Canada and the Euro area were upgraded, highlighting these economies’ healthy momentum. Taking a closer look at emerging economies, China's economy appears to be firing on all cylinders, which is reverberating positively across all developing economies, particularly in the Asia ex-Japan region. Russia’s slow but steady recovery, coupled with stellar dynamics in Europe, are boosting the outlook for Central and Eastern Europe. Growing uncertainty in the Arab peninsula and declining oil prices are putting a dent in economic prospects for the Middle East and North Africa, while Sub-Saharan Africa’s outlook is feeling the pinch from low commodities prices and geopolitical risks. The labor market rounded off another quarter of healthy gains, with growing evidence of shortages of skilled workers in several sectors of the economy. Although wage growth continued to disappoint through Q2, the compounded effects of robust new payroll numbers and softening inflation, along with buoyed sentiment and a healthy housing market, likely induced a recovery in consumer spending growth in the quarter. However, while economic growth remains dynamic at this stage of the business cycle, persistent political wrangling in Washington continues to foment doubts about the government’s ability to reflate the economy. Following the collapse of the healthcare bill in the Senate in early July, GOP leaders are now facing an uphill battle in passing the 2018 budget through the House, a prerequisite for pushing ahead with the government’s tax reform agenda. The economy will expand at a solid pace this year thanks to a robust job market, upbeat business and consumer sentiment and a turnaround in non-residential investment growth. However, expectations for fiscal stimulus continue to be scaled back, which is weighing on the outlook. The FocusEconomics Consensus Forecast panel pencils in growth of 2.2% this year, which is unchanged from last month’s projection. The panel expects growth to pick up slightly to 2.3% in 2018 on account of some fiscal stimulus being delivered. The Eurozone’s growth spurt likely remained strong in the second quarter as incoming data is bright. Economic sentiment jumped to a near-decade high in June and the composite PMI points to the best quarter in over six years. Hard data for the period is also robust: industrial production increased at the fastest pace in six-months in May and the unemployment rate is resting at a multi-year low. The positive news flow was echoed in the foreign exchange markets and the euro closed 21 July at the strongest level in almost two-years. Meanwhile, negotiations are finally underway a year after the United Kingdom voted to leave the European Union. The first round of talks took place in July, although they yielded little results other than introducing the two sides’ opening positions. The Eurozone’s growth forecast was upgraded for a second consecutive month as all signs point to strong growth. Moreover, with France’s elections in the rearview mirror and Greece’s finances high enough to cover upcoming debt payments, downside risks to the outlook have diminished substantially. The FocusEconomics panel sees a buoyant 1.9% expansion in 2017, up 0.1 percentage points from last month’s estimate. For 2018, growth is seen at 1.7%. While the economy continues to sail along, some clouds have started to emerge in recent months. Wage growth remains limited, constraining a sustained recovery in domestic demand and failing to boost inflation expectations. Moreover, machinery orders—a leading indicator for capital expenditure—contracted for the second consecutive month in May, indicating weak investment in the near future. While exports continued to expand robustly in June, the recent surge in imports suggests that the contribution from the external sector to overall growth may have declined in Q2. In the political arena, Prime Minister Shinzo Abe suffered a severe defeat in the election of Tokyo’s metropolitan parliament. While his leadership has not yet been called into question, the result signals voters’ growing disaffection with the ruling Liberal Democratic Party (LDP) and threatens the prospects for Abe’s reelection as the party leader in 2018. Japan’s economy is benefiting from healthy global demand, a weak currency and resilient domestic activity at home. The recovery, however, could be jeopardized by an appreciation of the yen, rising protectionism and a deterioration of the Chinese economy. Analysts see the economy growing 1.3% this year, which is unchanged from last month's projection. For 2018, they see growth at 1.0%. The economy is sending mixed signals in the aftermath of the general election and a few weeks after Brexit negotiations began in earnest. Both the services and manufacturing PMIs dipped in June, despite remaining in positive territory, and consumers grew markedly gloomier in the same month, likely due to the uncertain domestic political situation. Although the labor market continues to be a shining light, with the unemployment rate continually reaching fresh multi-decade lows, households’ purses are being pinched; even though inflation dipped in June, real wage growth likely remained negative. In the face of the squeeze on living standards, tensions are swirling at the top of government over whether to lift the current 1% cap on public sector wage increases, which has been in place since 2013. Chancellor Phillip Hammond has thus far resisted pressures from cabinet colleagues to loosen the fiscal straightjacket, in order to constrain public spending and pare back the budget deficit. The economy will weaken this year, as higher inflation bites into consumers’ purchasing power, and uncertainty whipped up by Brexit negotiations and a minority government at home deters investors. However, the Bank of England’s (BoE) ultra-loose monetary policy stance and healthy global demand should cushion the slowdown. Our panelists are forecasting 1.6% growth for this year, unchanged from last month’s forecast. For 2018, growth is projected to fall to 1.3%. Lower costs for energy, better weather conditions that led to lower food prices in a number of countries, and waning supply-side price pressures prompted global inflation to moderate to a seven-month low in June. Global inflation declined from May’s 3.4% to 3.2% in June. Inflation decelerated in both advanced and emerging-market economies. However, inflation was stable in China. Despite widespread downside risks from a global perspective, mounting inflationary pressures in Latin America, primarily focused in Venezuela, and higher inflation projections for the United Kingdom kept this year’s global inflation outlook unchanged. The FocusEconomics panel projects that global inflation will be 4.7% in 2017 and in 2018 analysts see global inflation moderating to 4.5%.